When Dr. Fred White and his wife, Kathy, traveled with us this summer to witness the National Baseball Hall of Fame and Museum induction weekend, they expected to see some familiar, famous faces. 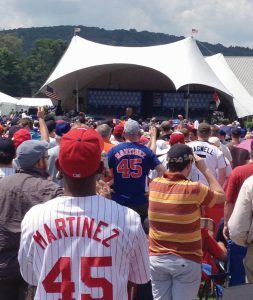 Fred also recognized someone not quite as well-known on the streets of Cooperstown, New York. While exploring the small town of about 1,800 residents, Fred saw writer Gary Kaschak talking on the phone. The author of “My Name Was Mickey Mantle” had recently been featured in the newspaper near Fred and Kathy’s home in Temecula, California. Fred recognized Gary from the photo that ran with the article. Fred and Kathy are repeat travelers with Sports Travel and Tours. Having found us via the Baseball Hall of Fame website four years ago, Fred and Kathy have already done the Mid-Western tour to Chicago, St. Louis, Kansas City and Minneapolis, and The Lakes tour that starts in Toronto and includes stops in Detroit, Cleveland and Pittsburgh. Like most of our customers, Fred and Kathy are avid baseball fans. They’ve held season tickets to the San Diego Padres for more than 30 years and have attended spring training in Arizona for more than 35. They were eager to take part in a Sports Travel and Tours induction trip and became even more interested when it was announced that Trevor Hoffman, a longtime Padres pitcher, would be inducted in 2018. The trip marked the fourth induction Fred and Kathy have seen live. In 2007, they traveled on their own to see Tony Gwynn’s induction, but Fred says they much preferred the experience of traveling with Sports Travel and Tours. Fred says Sports Travel and Tours staff do a great job of keeping their travelers up-to-date and informed. Over the years, Fred and Kathy have met sports stars—like former San Diego Padres pitcher Randy Jones and his wife, Marie Stassi, whom they spoke with in Cooperstown about his baseball career and battle with throat cancer—and they’ve also come to know our guides. “The thing that really catches me off guard is the knowledge of the guides,” Fred says. “We met Mindy Strauss, a young woman from St. Louis who led the Grand Slam tour, and she was just so knowledgeable and willing to answer questions.